We’ve all seen the Oscars, the Grammys and the BAFTAs. Whilst they may previously have been THE big awards of the year, we’ve brought something even bigger to the stage: The UKFast Community and Education Awards. These awards celebrate those extraordinary people among us who dedicate their time to going above and beyond for those around them. The remarkable characters who don’t see the barriers, who put others ahead of themselves and who inspire us all to be greater. Yesterday, we held the first The UKFast Community and Education Awards in our new auditorium. I have to admit, a tear or two was shed as we heard the stories behind our wonderful award winners. An idea from our MD Gail, the awards were originally planned to begin next year, but we knew that so many people are already doing so many incredible things that we needed to move it forward. So, in a matter of weeks we pulled together nominations from across Greater Manchester, made the impossible decision on the winners, and put the event together. As the evening came to a close, we announced the The Young Bravery Award, won by Amelia Carroll. 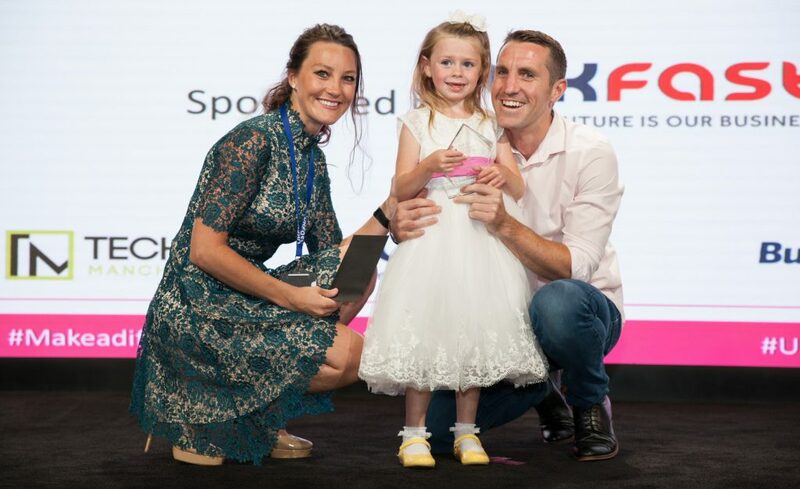 Amelia and her family have been friends of UKFast since our work with Cash for Kids and Key 103. Amelia and her brother Ollie have a very rare condition called Batten’s Disease. Five-year-old Amelia was told she wouldn’t be able to walk if she reached five years old, nor would she be talking or hitting milestones. In reality, Amelia this year ran the children’s run at the Great Manchester Run, taking on 1.5km for charity Ollie’s Army – raising awareness of Battens. As her name was announced, she walked up onto the stage with her dad applauding along with the crowd. As the entire room got to their feet in a standing ovation, we knew that we’d done the right thing in launching the event this year. Amelia’s is just one remarkable story of resilience, bravery and selflessness across Greater Manchester. Yesterday we were able to celebrate 16 winners, but we know that there are more out there. That’s why we’re already thinking about next year’s event. Huge congratulations and thank you to all of our winners and everyone shortlisted.